I've often perused Gourmet Magazine recipes, looked at the gorgeous photos, but rarely do I see one that is actually approachable for me. This one leapt from the pages of Gourmet and into my heart! I will be serving this over raw cabbage in the VERY near future. Cook carrots in a medium saucepan of boiling water until tender, about 8 minutes. Drain, then rinse under cold water until cool. Drain well. Meanwhile, pulse onion and garlic with oil, vinegar, ½ teaspoon salt, and ¼ teaspoon pepper in a food processor until very finely chopped. Toss with carrots and chill at least 3 hours. 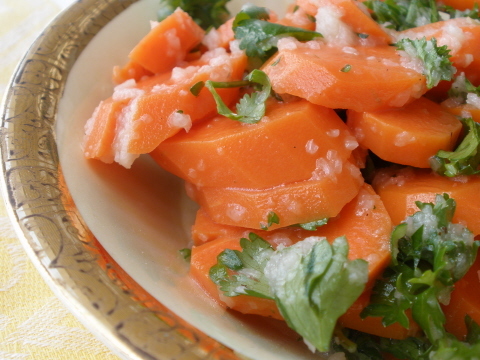 Just before serving, toss salad with cilantro, parsley, and salt to taste. NOTE: Salad can be chilled up to 24 hours. Add herbs just before serving.